Last few months have seen a lot of new. New house, new area, new friends, new village, new schools, new and interesting ways in which DIY can be botche (in the past, that is. We do things properly), new playparks and new beaches. Okay, so the beach is now an hour and a half away, not a 5 minute stroll. And the rockpools aren’t there. And Skegness was, to all intents and purposes, closed when we visited during the Christmas break… But it’s the sea, dammit, and since I lived right by it for the last 10 years it still brought a lump to my throat when I saw it again. Kids weren’t so impressed, mind you. It was windy, the sand blew in their faces and they couldn’t wait to get into McDonalds for lunch (first place we found open!). We’ll be back in the summer, when no doubt we’ll have to pay for parking and find the beach stuffed with tourists (like us). Up here on the Shetland islands, the weather can be horrendous. Day after day of sideways rain, fog, mist, murk, wind. Just, generally, bad weather. Days when you long to get out of the house, even if it’s only for the few seconds it takes to put a bin bag into the box just to say you’ve been outdoors, got some fresh air, and now have some more weather to talk about. Days where you question why the bloody hell you’re on a small rock in the north Atlantic, the same latitude as Newfoundland! Days where you look at London, basking in double-figure temperatures (10 is still double figures and feels warm to us), wondering what was so bad about Kent after all? But then… Then you get those magical days, days that can come at any time of year and just take your breath away. Days when the light is just so, the sea sparkles and makes you realise why. Why, even after the very first visit to Shetland when your breath was ripped out of your lungs by a wind so strong it rocked the hire car, when the fog was so thick you saw nothing between Sumburgh airport and Lerwick, when it was so bitterly cold compared to comfortable Kent in Janaury, why you’re here. You get hit by a wave of peace so strong it rocks your world. You have to stop, pause, admire nature in all her glory. You have to offer up thanks to a beneficent God that amidst all the chaos and trouble in the world, she’s sent you this still, calm moment. Even if the wind is still raging, the storm is still blowing, something about that moment feels still and calm. 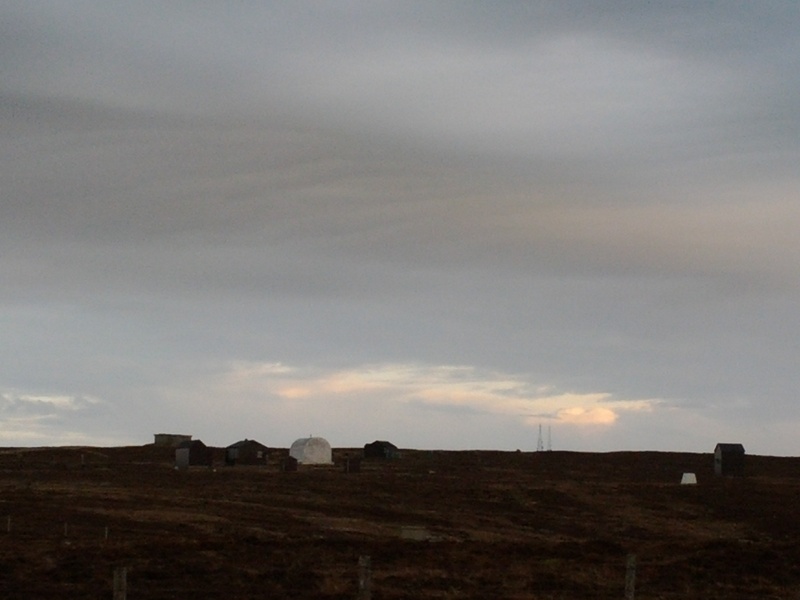 Incidentally, when you see the weather on TV, the temperature on Shetland comes from the white shed in that picture. There’s your useless fact for the day. This is my first entry into The Gallery (http://stickyfingers1.blogspot.com/2011/04/gallery-week-56.html) and the challenge for Week 56 is “Green”. Photo above shows my boys and was taken using the Vignette app for my Android phone. I’ve got it set to apply random effects and frames to each photo it takes so from one shot to the next I’m never sure what’s going to come up. This one, clearly, had a green filter applied along with a panoramic frame (to show a bit more of my messy sitting room). Not sure what other effects got in there. Anyway, that’s it. My (Green) Boys. And my first stab at The Gallery.